I've been dreaming about a trip in San Francisco forever. It's always been these two cities : New York and San Francisco. Not very original, I admit it. Anyway. In my head, it was colorful with all these lovely victorian houses, green parks and large avenues -you know, like in Girl Boss. And you know what, it was exactly like this. And more ! That 3 days trip in San Francisco wasn't really planned, but when we got there, we've been pretty good with improvisation. Or is it just this city that make you feel home in only a few hours? We've seen so many different faces of SF, when we left, we felt like we lived there for a month. We had the chance to meet the local, take our time, go from a quiet park to a hip café, a busy avenue to the bay in a few minutes. Oh, the bay, so magnificent... Let me show you the best of San Francisco in this quick guide. It's a city like no others! WELCOME TO CALIFORNIA! Getting to such a big and iconic city can be overwhelming sometimes -where should we start, what's not to miss, how can I make the best of my trip? As usual since we have a baby, we've decided to take it EASY and adopt the slow travel attitude. Get lost in San Francisco's streets, stop in many little cafes, enjoy the sun, soak up the atmosphere... At the end we were impressed by all the things we've been able to do and see in such a short time. Ride the old cable car. If you want to feel like a local, forget about the-cute-tramway-you-see-in-the-movies and take a ride in the old tramways that are all over the city. It's vintage, really cool, and not packed with tons of tourists and selfie sticks. Start the day in Alamo Square. Not only to see the Painted Ladies but to enjoy the morning tranquility, take a coffee and meet the locals walk their dogs, pause for a moment and enjoy the views. Cruise in the Bay and below the Golden Gate Bridge. I know it's a budget, but skip your shopping plans and keep your dollars for a cruise. We chose one in a catamaran to, once again, avoid the tourists. We were only twenty people with the crew, and at the end of the day we had made some friends aboard. The views are magnificent, you got to see Alcatraz, San Francisco's skyline, the bridge and, if you're lucky, a couple of whales and sea lions. All that for 45$/pp. Get lost in Hayes Valley. Down Alamo Square is a very cool hip neighborhood. Not only you'll find beautiful shops and cafes (see my 10 addresses in San Francisco below), but you'll also enjoy a nice trendy atmosphere. Discover Mission District's street art. Welcome in the latino district! This place is incredible, filled with eccentric shops, great street art (it's not Wynwood but... could be!) and delicious food from Latin America. Eat oysters by the water. Or get a coffee, an ice cream or whatever you want. On the Embarcadero, San Francisco Ferry Building hides some increeedible restaurants in a cool industrial atmosphere. Run by the ferry piers. Either you're a runner or just want to walk, a beautiful, wide sidewalk goes from the Ferry Building to Pier 39. It's 2.3 kms of sublime views. Maybe that's because we've been living in Asia for so long -probably-, but finding a nice sidewalk to walk with a stroller / to run is pretty amazing for us. Enjoy the colorful vibes in Castro. Of couuurse you HAVE TO see the gay district! Because first, you're in San Francisco and second, that's where you'll find some reaaally nice bars. And fun shops. With strange things to buy. Ahem! Climb up and down and up and down... and enjoy the views. What makes San Francisco so magic is its terrain. You're constantly going up and down (hence the tramways), which offers you spectacular views at every corner. Drive on the classic Road 101. I assume the cliché. Even if it was on a bus and just for a few hundred meters, we drove on the Road 101, yeepeee! That's all I can get now. One day, we'll drive down the West Coast. One day! San Francisco is not a small city, but most of the things to do are within a short walking / public transports distance, so it's easy to explore the city in just a few days -and to love it in even less time! Start your day in Alamo Square, where you will enjoy a gorgeous view on the city with, on foreground, and beautiful range of victorian houses -and yes, that's where you find the famous Painted Ladies (photo above). 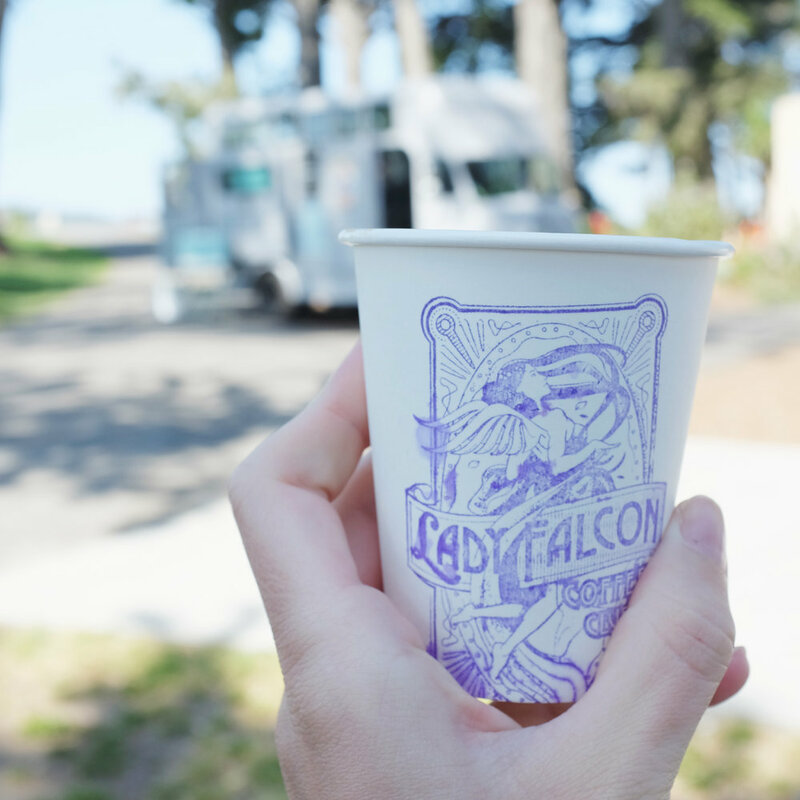 Get a coffee in Lady Falcon's cool airstream trailer, then walk down to Hayes Valley, where you'll discover some beautiful designers shops and cafes. Continue your way to Mission District for a whole different atmosphere -FIIIESTA! Street art, music and latino vibes awaits. Get your coffee in one of the Ferry Building's many cool places, fuel up then head to Presidio De San Francisco, a fabulous park facing the Golden Gate Bridge. There are plenty of walks to do, from 20 minutes to hours. Enjoy the vista and try to spot some whales on the bay. Then hop on a bus to Le Castro, to finish the day with a few cocktails in San Francisco's gay district. Climb up -or take a ride in the cable car- to Lombard St to enjoy a spectacular view on the city -go (very) early to avoid the crowds. Get lost in the hills of San Francisco. Then finish your trip in beauty -with a cruise on the bay. They all start from Pier 39, that's where you'll get the infos you need. We went with Cat Sailing and where really happy with them. If you like beautiful places and good food, don't miss the tapas in Barcino before you leave. And one of their fabulous cocktails -even the mocktails are incredible! You won't be surprised if I tell you San Francisco is a great destination to travel with a baby. Public transports always have a stroller friendly access, sidewalks are wide, streets aren't busy or noisy (compared to Hong Kong it felt like walking in a village! ), temperatures are perfect (20°C in June, that's what I call perfection). Plus in the US, you automatically get the priority with a baby (you might thing that's normal, but not in every country no no no...). Always pack some baby foods with you -even when you go in a big city. For some reasons, we struggled to find some baby purees in San Francisco. As we were there only for 3 days, we didn't want to bother looking all around the city for food, so we were happy we had everything we needed. Many Uber drivers refuse to take the course if you don't have a baby car seat. So you might stick with public transports. It's pretty easy, cheap and fast anyways.